What a title, and what a decadent meal! It’s been a while since we made such an all consuming dinner like this- but warm weather called for grilling out and our meal plan had some tasty recipes for us to use. The pork marinates for 2 hours, or overnight- so plan ahead. 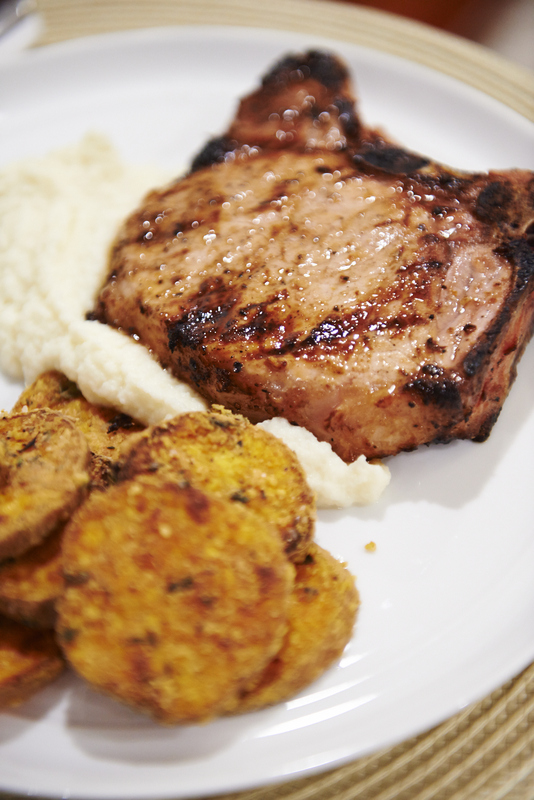 The favorite was hard to pick from the trio of yumminess- the crisp cheesy sweet potatoes were perfect bites, creamy cauliflower puree was full of decadent butter and milk set under a perfectly grilled pork chop that was bright and lemony with hints of Dijon and pepper…. I was really excited to make the puree, I love potatoes and have nothing against them, but when I can use a bonified vegetable that tastes just as good and that the baby can eat too- it’s a major win. The recipe I very loosely followed called for heavy cream and 1.5 sticks of butter- we used a bit of fat free milk and 1/2 the butter, it was for cauliflower after all, so it’s balanced- right? In a large resealable bag, combine lemon juice, oil, garlic, mustard, salt, pepper, garlic powder and red pepper. Place chops in bag, seal, and refrigerate 2 hours or overnight. Turn bag frequently to distribute marinade. Preheat an outdoor grill for high heat. Remove chops from bag to a tray, dicard marinade. Lightly oil the grill grate. Grill pork chops for 5 to 7 minutes per side. In a large pot of boiling salted water, cook the bouillon cube then add cauliflower florets until tender, about 7 minutes. Drain well. Return to pot over medium high heat and stir for 5 minutes, to dry out most of the water. In a small saucepan, combine the milk with the butter and bring to a simmer over moderate heat just until the butter is melted. Puree the cauliflower with an immersion blender stick in your pot or in a blender with the warm milk/ butter mixture until smooth, then season with salt and cayenne to your own taste. Preheat the oven to 450′. Line a baking sheet with parchment paper. In a large plastic bag, toss the sweet potato coins in the corn starch to coat.